3 words: Bill, don't sing. I can't believe the "instruments" don't include a bicycle wheel. But good work, G4! 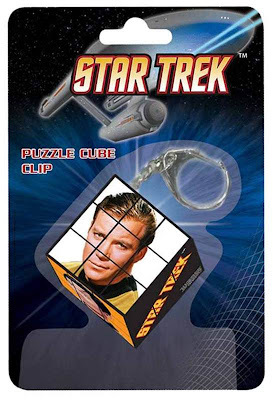 Today's Trek News: Spiders and KHAAAAN??? To some, nothing is scarier than spiders, unless you consider William Shatner’s career in the late 70’s (zing!). But there were a few exceptions and even Chris Pine can admit it’s pretty difficult to follow Shatner as James Tiberius Kirk. One film that Shatner did before throwing the maroon jumpsuit back on was a little film called Kingdom of the Spiders in which he takes down a legion of evil spiders. Shatner played Dr Robert Hansen, who is sent to a small town after a serious of mysterious animal deaths, only to discover that it was only the beginning, and that an evil spider army was behind the whole thing. Finally, the film is making it’s way to DVD for all of us to relive, and we even have the original trailer for you to get excited for all over again. Special features on the DVD include an all new interview with Shatner, audio commentary by Director John Bud Cardos, Producer Igor Kantor, spider wrangler Jim Brockett and Cinematographer John Morrill. Also included is a Spider Wrangler featurette and rare behind the scenes footage. 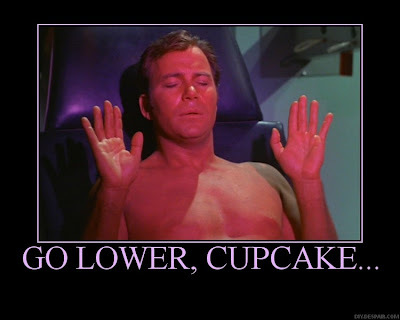 YEAH MORE SHATNER COMMENTARY! I hope it's as good as the stuff on Incubus. The rebirth of Khan: should he be played by an unknown in Star Trek 2? Rumours abound that JJ Abrams - if he is to helm the revamped Enterprise's second outing - will cast Lost hunk Nestor Carbonell in the role made famous by Ricardo Montalban. Is that playing too safe? Directors have their favourites. Follow David Lynch on his latest journey to Planet Weird and you'll probably find Laura Dern landed some time before you; pick up a Sam Raimi flick and don't be surprised if he's found some way to shoehorn in Bruce Campbell. One of the things about last year's Star Trek revamp that impressed me most was that Jj Abrams didn't fall back on tried and tested actors from his previous ventures to populate the bridge of the USS Enterprise. Sure, there was Simon Pegg, who starred in the director's debut movie in charge, Mission Impossible 3, and Zoe Saldana from his Bad Robot production company's TV series Six Degrees. But Chris Pine was a near unknown, and the likes of Zachary Quinto and Karl Urban (whose Eomer in the Lord of the Rings trilogy was over half a decade ago) were plucked from Heroes - in which Abrams had no involvement - or obscure genre fare like Pathfinder. We should perhaps give the film-maker the benefit of the doubt, then, over a new report that Nestor Carbonell, aka the mysterious Richard Alpert from Abrams's TV series Lost, is set to play Khan in the forthcoming sequel to Star Trek. The casting is not yet confirmed, and it's not even certain that the next installment of the adventures of Captain Kirk and co will focus on the bad-guy portrayed so memorably by Ricardo Montalban in 1982's excellent The Wrath of Khan. But the story emanates from comingsoon.net, who just posted a one-on-one interview with Abrams, so it's not too hard to imagine that it might have been sparked by some off-the-record comments that couldn't be published as part of the main piece. NOOOOOOOOO! For the love of all that is good and pure in the world, DON'T DO KHAN! That is a surefire way to torpedo this new franchise in the second movie, DON'T DO IT!!!! Expect more discussion of this on the next show. The Art of Khan on Facebook! CONTEST - What should Carol Marcus be saying? 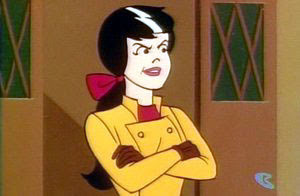 This is Alexandra Cabot. But that doesn't help me make more sense of that fic. The fantastic photo is not from my collection (sadly) but I found it on the Retrospace blog, located here. 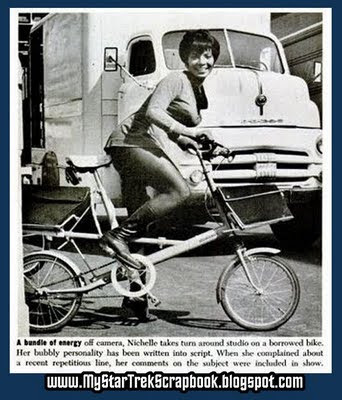 The page is from a 1969 cover article on Nichelle that features many good pics! But this one can't be beat for sheer awesomeness. TOTALLY agree. There isn't even a measuring system on earth capable of calculating this awesomeness of Nichelle in this photo. Nichelle conquers the world!! Those tweets were FAKE! O.M.G. To help his buddy Conan avoid a lawsuit, Bill did a repeat appearance performing the Real Words(tm) of Levi Strauss. Go Bill! I love his expression on "LMAO", especially since I'm sure he has no idea what it means (even after it was explained to him multiple times). Bill and his Wax Self: FREAKY! Elizabeth is very funny in this interview. Allyson Lazar, is that you being interviewed? If you're in L.A. November 5-8, here's a coupon to get $8 off admission to Madame Tussauds Wax Museum. Get there quick before all the charm & hotness melts the Kirk figure! Note that the coupon says STAR TREK THE EXHIBITION (still no punctuation but now they can afford ALL-CAPS!) is also in L.A. Hey, LAHB stringers, go forth and report back! How is this different from what's in San Jose? 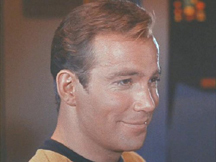 Few fictional characters have mastered the still pose like Captain Kirk. The hand-on-chin thinking pose. The listening-to-Spock-incredulously pose. The quiet-sitting-and-staring-at-the-Klingon-Bird-of-Prey pose. So that the "Star Trek" man is getting honored at Madame Tussauds Hollywood with his own figure makes perfect sense. We just want to know exactly which pose Tussauds opted to go with, since there are so many iconic stances to choose from. More of JK's experience at the Tech, and loads of Trek crap! Bill will be appearing at the unveiling of a wax figure in his likeness at the the world-famous Madame Tussauds wax museum at 11:30am on Wednesday, November 4, 2009. The museum is located at 6933 Hollywood Boulevard in Hollywood, California, a couple blocks west of the Mann's Chinese Theatre. How is it possible to capture charm & HOTNESS in wax? Charm & Hotness - Is there an app for that?